J: Ed managed to achieve one of the improbabilities in his life. Did he solve the riddle of life, the universe and everything? No. Did he manage to get himself a girlfriend? No. Did he manage to find me a girlfriend. Hey, I said improbable, not impossible. Ed managed to coax me to Uptown Centre. And anyone who knows me knows I dislike Uptown. It’s massively big and it confuses me. I feel more at home in Mayfair Mall or Hillside Centre. Even when I’m walking in the area of Uptown, I’d rather go around the behemoth then use it as a shortcut. But Ed said the one thing I and I am sure no true Scotsman can resist, he offered to buy. This is one of the reasons he is my best friend. He knows me as much as I know myself. E: Sometimes I know James too well and have to roll my eyes. I just don’t get why he waxes poetic about what was way back when or in exholing the virtues of how evil these mega-malls can be. When I’ve hit Japan (and Edmonton) to visit the mother of ’em all, where Luke and Vader could have done a light saber battle in a facsimile of the Senate chamber and those floating council seats, everything else pales in comparison. Uptown needs a classic arcade somewhere in its facilities! But in order to kill time, into these so we can hit a nearby restaurant, we hit Uptown to hit Qoola. I’ve grown to love their nicely chilled yogurts. Their creamy texture goes well with the coconut shavings that I always choose every visit. The combination really works and I recommend it. Typically, I avoid the candy stuff, but sometimes I do have to help myself with a light sprinkle of Nerds. 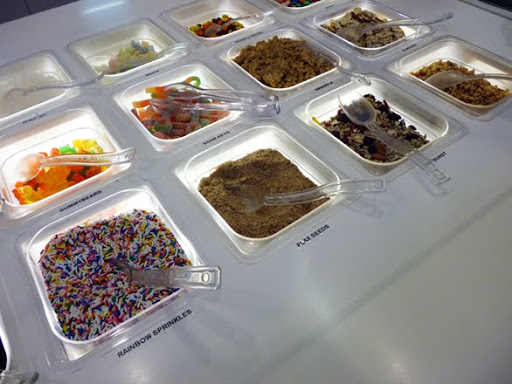 But I love the idea of creating a mountain in your wax cup before dotting the landscape with your choice of toppings. For me, it was chocolate sprinkled with shaved almonds. E: Despite a good start, Qoola at Uptown needs to also include a super-sized cup so people can have one massively huge smoothie. I’m finding inconsistency in what the employees tell me as the limit of how high I can fill a cup up to. And if only a big gulp sized cup was used, I could fill it up to my heart’s content of yogurt and whatever else they have in their bar of fruits, candies or cake dressings. J: I was disappointed to discover that their chocolate yogurt tasted like a fudge ice cream bar. Now I know chocolate yogurt tastes like chocolate because TCBY at Tillicum Centre’s SilverCity Victoria Cinemas served such a flavour. But I”m guessing TCBY and Qoola have the same supplier because it was only a matter of days later that SilverCity’s “chocolate” matched the taste of Qoola’s. It’s a taste that disagrees with me. I didn’t like the taste while growing up and I don’t like it now. Ask anyone who knew me as a child living in the area of Blanshard Elementary School and they’ll tell you of my fetish for orange or raspberry frozen yogurt bars from Norm’s Grocery. And it was cheap at 30-35 cents. Qoola does have a couple of minor kinks to work out but it still looks like a child’s candy factory. You just won’t find Gene Wilder behind the counter. This entry was posted in Food, Reviews and tagged British Columbia, Desserts, Franchise Operations, Take Out / Take Away, Victoria. Bookmark the permalink.